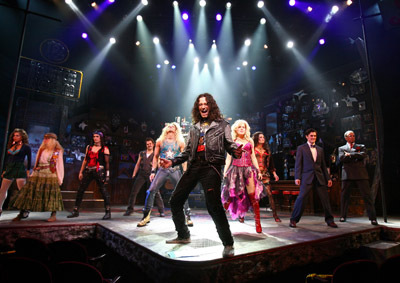 NEW YORK — Jason Lyons, LD for the Broadway musical Rock of Ages, is using a Martin MAC rig for the rock anthem-infused love story at the Brooks Atkinson Theatre. One of the ideas of the show, Lyons said, was to have a “PAR can rock”-styled flavor of 1980s. He started by creating a configuration of MAC 2000 Washes that worked both theatrically and provided aerial looks for the show’s big numbers. Lyons used six MAC III Profiles to create a symmetrical pattern and placed one upstage center to help drive some of the big concert moments. “I was very impressed with the punch, the imaging and the smooth movement for such a large fixture,” he said. Besides the MAC III Profiles and MAC 2000 Washes, the rig, supplied by Christie Lites, includes MAC 2000 Performances, MAC 700 Profiles and MAC 500s.